What is a Women’s Giving Circle? It’s a pretty basic concept: Like a Stock Club, members get together, toss money into the kitty, make a group decision, and send the money out. Except with a Giving Circle, the money goes to charity. Giving Circles can be formed by anyone with similar interests – women, men, youth, couples, companies…the possibilities are endless! We are modeling our first one on “100 Who Care,” a national movement with the premise that if one person gives $100 to charity, that’s all well and good. But what if 100 people in a Giving Circle each give $100? That’s $10,000 to charity, which is so much more impactful!! 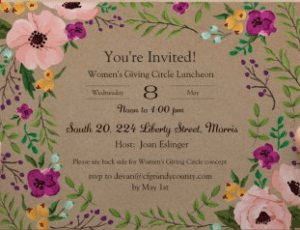 This first Women’s Giving Circle is housed at the Community Foundation of Grundy County, but the finer details of the Circle will be determined by the women who join. Your host, Joan Eslinger, is happy to brainstorm with you about your ideas for making this a Circle that meets the charitable goals of you and your fellow members. After our first luncheon on May 8th we’ll be brainstorming about next steps, group name, meeting frequency, etc. Please take a few minutes to look at the “100 Who Care” website for models in other communities. We can design ours however we choose!